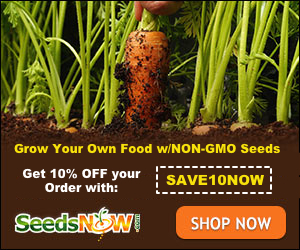 Do you remember the commercials for Pepperidge Farm cookies and Goldfish and things? They had an older man from somewhere in New England that would say "Pepperidge Farm Remembers" but it was more like "Pepperidge FAAAAAM RememBAHS" because he had that crazy accent. I thought of him this morning when I was driving and saw this. My first thought was that when he sped up all of the boxes of Goldfish would be headed my way and I'd run away with them. Actually, what caught my eye wasn't the actual fact that the door was open, but the driver was clearly having a conversation with someone was GESTURING (I put this in caps so you could see how emphatic the gesturing really was). I was trying to see his passenger and thought "is there even a seat for a passenger in a truck like this?" and as I was peering through the back door, I realized it was open and shouldn't be. I'm also pretty sure there wasn't anyone else in that truck. After all that thinking, the light turned green and we were off. Nothing came crashing out as he took off. Then we slowed a few times for traffic and I got so close once I debated yelling "sir, your door is open back here" but I figured he wouldn't hear me or realize he was the sir to whom I was speaking. My final thought, and why I took the picture, was the irony. Do you see the word REMEMBER on the left door? We'll never know what to REMEMBER because the driver didn't REMEMBER to close the right side door! I wonder if he drives around with the door open to aid in cooling the vehicle. When he got to his next stop, did he wonder why the door was already open? This reminds me of a lady from when we were little. She was this really nice, tiny lady from somewhere with a heavy accent and she would sometimes take us to the beach in the summer. How she managed the 3 of us is still a mystery and she couldn't swim, so why my mother let us go is another mystery. 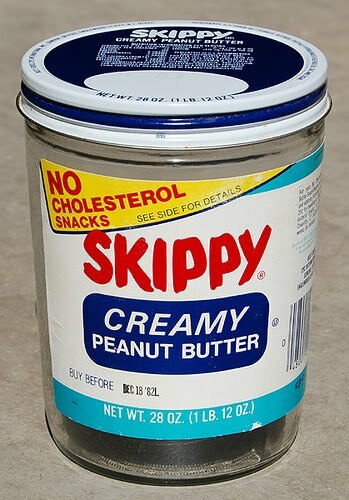 She always brought a bag of popcorn and lemonade she made in a Skippy Peanut Butter JAR WITH A METAL LID!! Do you remember those? Glass peanut butter jarss???? And who would think to put lemonade in one? Anyway, the point of this little story is that she had this crazy hatchback, brown car, and I can't even tell you the make of it but it seemed huge. We were leaving the beach one day and in the flurry of activity, she didn't close the hatch. I thought this was truly the funniest thing in the world and every time my sister tried to tell her, I would cover her mouth so she wouldn't tell. Riding down the road with the hatch open was hysterical to me and I have to admit I'm kind of chuckling as I write this. As we pulled into the yard, we hopped out the back. The poor lady just couldn't understand how we had already gotten out of the car. By now we all thought this was the funniest thing ever. 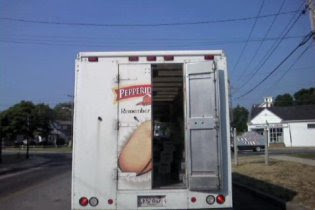 I wonder if the Pepperidge Farm delivery man had the same wonder she had? If he had arrived at his next stop with NOTHING left because it had all fallen out, would he have understood? Would he had been mad? Would I have flagged him down long before all of the contents of the truck fell out? Surely not, I would have been laughing too hard to tell him! It probably already fell out before you even saw him! Somewhere there is some lucky person swimming in Goldfish! lol. You should not make fun of people who GESTURE! :-p I wish I could gesture in email. Wouldn't that be awesome?! My co-worker asked me last week if I couldn't use my hands to talk would I suddenly go mute? Eek. marybt- you must be European as we know they can't speak a word without a gesture. As I get older I get worse and worse. I catch myself doing it while I'm on the phone all the time and I must look so ridiculous.